Fabric Art Workshop: Exploring techniques and materials for fabric artists and quilters by Susan Stein. There you have it! 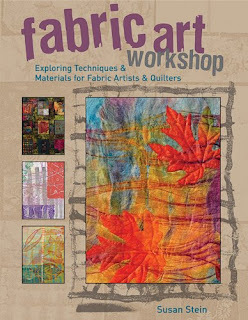 If you would like to learn about different surface treatments that you can add to your quilting or other fabric projects, this is an excellently written book to get you started. Not all of Susan’s techniques are easy-peasy beginner stuff either. This is a book that you can grow with. While I did not find a lot that was really new to me, I was impressed by how well it was written and illustrated. There are more than two dozen techniques taught with variations on each and LOTS of pictures. I wanted to look inside but clicking on the image just opens the jpg. You had to click on the printed title link. I've fixed it...thanks!